Like many of Elmo Hope's compositions, this medium swing has a melody that adeptly weaves and twirls through the changes. Lead sheets, second parts and concert condensed score available. Bertha Hope recalls some of Elmo's ideas on improvising. The audio excerpt starts with the ensemble introduction which is notated in all of the editions. In addition to the melody lead sheets, second part editions are also available, so if you play in a quintet, you can play Elmo's original arrangement. Elmo Hope was a classically trained pianist with technique rivaling that of his childhood friend Bud Powell and a composer of music whose inventiveness and complexity approaches that of Thelonious Monk. In fact, Elmo, Thelonious and Bud used to hang out so much together they became known as "The Three Musketeers." 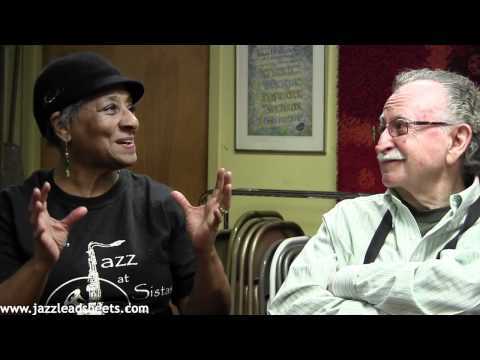 Video: After a rehearsal, Bertha Hope, Jerry Dodgion, and Putter Smith stayed in the jazzleadsheets.com studio to talk about the great Elmo Hope. Bertha was married to Elmo until his passing in 1967. She's an accomplished pianist herself, who studied with Richie Powell (Bud's brother) in Los Angeles. Jerry Dodgion, saxophonist, knew Elmo during the time they were both living in California. Putter Smith has been an in demand bass player in Los Angeles since he was a teenager. He played with Elmo for a six week residency in Los Angeles when he was 17 years old. Elmo revisited this composition in 1961, recording it in a trio format with bassist Butch Warren and drummer Granville T. Hogan. You can read about and listen to more of the music from this quintet session: see Chips, Later For You and Crazy.